Camilla Kim created Three Happy Coconuts Sleep Collection. She's the second generation daughter of a family that produces mattresses using all natural fibers since 1996. Her father taught us to value nature, and believe in pursuing a natural lifestyle. Her collection of plush mattresses, pillow toppers and pillows represents her company's key values: family, comfort, and safety in the certified organic materials. All these products were created out of concern for her two daughters' health, and belief that they should not be at risk while sleeping--the most precious moment of their day. Three Happy Coconuts uses certified organic materials throughout, not just in the exterior components. This means our cotton, wool, natural latex and coconut fibers each have certifications, plus involve sustainable production. And they do not use any synthetic materials, so there is nothing to fear in regards to toxicity, or metal springs emitting electro magnetic fields. They stand by their values and invite you to experience truly blissful sleep! This healthy, hypoallergenic alternative to a traditional cotton or wool pillow is made of organic latex, which gives proper head and neck support, while offering relaxing comfort and flexibility. Made of durable latex, it will last twice as long as a traditional pillow because the latex is inhospitable to bugs, dust mites, and most important, does not retain heat or water, resulting in a mold- and bacteria-free environment. Great for those who suffer from allergies and chemical sensitivities. 100% natural latex provides soft, resilient support that cradles the shape of the head. Does not retain heat or moisture, naturally hypo-allergenic and germ- resistant. Perforated to provide adequate ventilation and air flow. Comes with lightweight cotton protector that is machine washable. 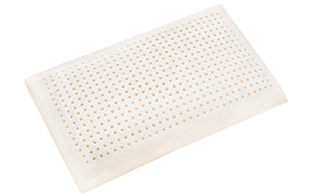 Our luxurious organic latex contour pillow provides proper support for the head and neck. The non-heat retaining qualities of natural latex keep the most important part of your body cool and comfortable during a night's rest. 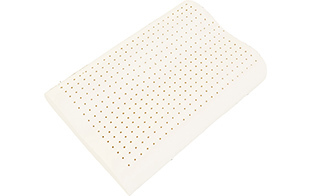 Made with organic latex the pillow has soft touch plus excellent restoration resilience. Special features- soft, cool in summer and warm in winter. It prevents snoring and shoulder-ache. Adequate elasticity and smooth touching will promote health state and stamina as well as sound sleep. This pillow has all the requirements the pillow should have. - Good ventilation will eliminate sweat keeping the environment hygienic. - Adequate elasticity will keep the environment restful. - It adjusts to the body contours. - The height of pillow usually is 6 to 8 cm and a 15 degree angle is an ideal in most cases. - It will prevent snoring. - With perfect height, it will cause no extra pressure on spine keeping you're your body in a stabilized state. I had the pleasure of trying Three Happy Coconuts Happiness Pillow and I absolutely love it! I've been on the hunt for the perfect pillow for some time now and I've finally found it! I've literally spent hundreds of dollars over the last year or so on pillows, trying to find one that I love. Before trying Three Happy Coconuts Happiness Pillow I had 3-4 pillows that I would cycle through during the night. I would wake up uncomfortable with neck and back pain and switch to another pillow hoping for some relief. It was horrible! I'd see a pillow in the store and think maybe this one will be better, but it never was. With the Three Happy Coconuts Happiness Pillow I can finally sleep comfortably all night long. Another problem I had with the many pillows I've bought over the years is that they would smell like chemicals and would make me nauseous because the smell was so strong. It was so bad that I'd literally have to air out the pillow for a week before I could even stand to use it. Then of course I dreaded breaking it in because the chemical smell was never really gone and every time I moved the smell would come out of the pillow. With Three Happy Coconuts Happiness Pillow there is no strong chemical smell because it's made with organic latex foam and has an organic cotton cover. One of the best features about this pillow besides it being incredibly comfortable and made of organic material is that it has extremely good ventilation. After having my son I'd wake up in the middle of the night with my neck drenched in sweat. I was told that it was hormones by my doctor but since using the Happiness Pillow I no longer wake up sweaty. I also no longer feel the need to toss an turn during the night. I'm having the best sleep I've had in years thanks to the Three Happy Coconuts Happiness Pillow! I highly recommend the Three Happy Coconuts Happiness Pillow! Click HERE to learn more about Three Happy Coconuts! all natural plush mattresses and pillow toppers! Follow Three Happy Coconuts on social media!